VANCOUVER , Feb. 28, 2019 /CNW/ - IsoEnergy Ltd. ("IsoEnergy" or the "Company") (TSXV: ISO; OTCQX: ISENF) is pleased to announce that drill hole LE19-06 assayed 4.0 metres of 3.8% U3O8, including 0.5 metres @ 13.7% U3O8. LE19-06 was collared 30 metres to the east of drill hole LE18-01A, the original discovery drill hole which returned 8.5 metres @ 1.3% U3O8 including 2.5m @ 3.6% U3O8. LE19-09, a 30 metre step out to the west, intersected strong radioactivity that consists of 4.5 metres of fracture controlled, disseminated and replacement styles of pitchblende uranium mineralization (>1,000 cps RS-125), as summarized in Table 1. This includes 2.0 metres of strongly elevated radioactivity that averages >20,000 cps (RS-125). The Hurricane zone is a new discovery of high-grade uranium mineralization on the Company's 100% owned Larocque East property (the "Property") in the eastern Athabasca Basin of northern Saskatchewan (Figure 1). As a result of its successful exploration efforts, the Company is expanding its 2019 winter drill program to further define the extent of the mineralization which currently stands at 60 metres long and 38 metres wide and remains open along strike in both directions. The Company, having raised $5.5 million in December 2018 , remains fully funded for this expanded program and a follow-up drilling campaign that is planned for the summer. Craig Parry , Chief Executive Officer commented: "The results of along-strike drilling are excellent and confirm we have made a high-grade uranium discovery. Based on historical drilling we know the mineralized system is at least one kilometre long and with uranium mineralization intersected in seven of eight drill holes completed to date, an expansion of our on-going drill program was an easy decision. The additional drilling will help to set us up for an exciting fully funded follow-up drilling campaign after spring break-up." Steve Blower , Vice President, Exploration commented: "I'm pleased that our along-strike step-out drill holes have hit strong uranium mineralization in both directions. With current dimensions already measuring 60 metres long and 38 metres wide, the Hurricane zone is growing and is open for expansion. The tenor of alteration in the sandstone and basement is strong and there is elevated uranium geochemistry to the top of the sandstone – all key features of larger uranium deposits in the Athabasca basin." Drill hole LE19-06 is the first along-strike step-out to the east of the discovery section. The drill hole pierced the sub- Athabasca unconformity 30 metres east of the discovery section and intersected two main intervals of fracture controlled, disseminated and replacement styles of pitchblende uranium mineralization (>1,000 cps RS-125), as reported earlier (see news release dated February 11, 2019 ) and summarized in Table 1. An upper zone of sandstone-hosted uranium mineralization is followed by strong uranium mineralization at the unconformity that averages 3.8% U3O8 and 1.1% Ni over 4.0 metres. Included in the interval are maximum values of 13.7% U3O8 and 1.2% Ni over 0.5 metres. Figure 2 shows the location of the drill hole in planview and Figure 3 shows the location on a cross-section. Note that the strong mineralization in LE19-06 is open to the south. A core photo of the mineralization is included as Figure 4. Collared 30 metres west of the discovery section, drill hole LE19-09 intersected substantial uranium mineralization along-strike of previously disclosed drill holes LE18-01A and LE19-02 (Table 1). The main intersection consists of 4.5 metres of fracture controlled, disseminated and replacement styles of pitchblende uranium mineralization (>1,000 cps RS-125), as summarized in Table 1. This includes 2.0 metres of strongly elevated radioactivity that averages >20,000 cps (RS-125). Figure 5 shows the location of the drill hole on a cross-section. Note that the strong mineralization in drill hole LE19-09 is open to the south. 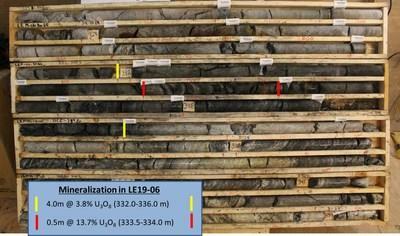 Figure 6 is a core photo of the mineralization. 1. Radioactivity is total gamma from drill core measured with an RS-125 hand-held spectrometer (RS-125). Drill holes LE19-07 and LE19-08 both intersected substantial lengths of elevated radioactivity. LE19-07 was drilled to the north of LE19-06 on section 4585E. It intersected a long interval (6.0 metres) of weak to moderate radioactivity at the sub- Athabasca unconformity. Drill hole LE19-08 is the first hole drilled along-strike to the west of the discovery section. It intersected two intervals of elevated radioactivity, including 3.5 metres of weak to moderate radioactivity at the sub- Athabasca unconformity. Assay results for both of these drill holes are pending. Due to the successful intersection of uranium mineralization in all but one of the eight drill holes completed to date, the Company has expanded the current drilling program to 12 drill holes from 10. The expanded program allows an acceleration of more aggressive step-outs along-strike of the existing intersections and is expected to be complete by mid-March. The scientific and technical information contained in this news release was prepared by Andy Carmichael , P.Geo., IsoEnergy's Senior Geologist, who is a "qualified person" (as defined in National Instrument 43-101 – Standards of Disclosure for Mineral Projects). Mr. Carmichael has verified the data disclosed. This news release refers to properties other than those in which the Company has an interest. Mineralization on those other properties is not necessarily indicative of mineralization on the Company's properties. An RS-125 hand-held spectrometer was used to verify that the radioactivity is due to uranium. As the drill holes reported herein are vertical or near-vertical, and the mineralization is interpreted to be horizontal, the true thickness is expected to be within 90% of the cored intervals.